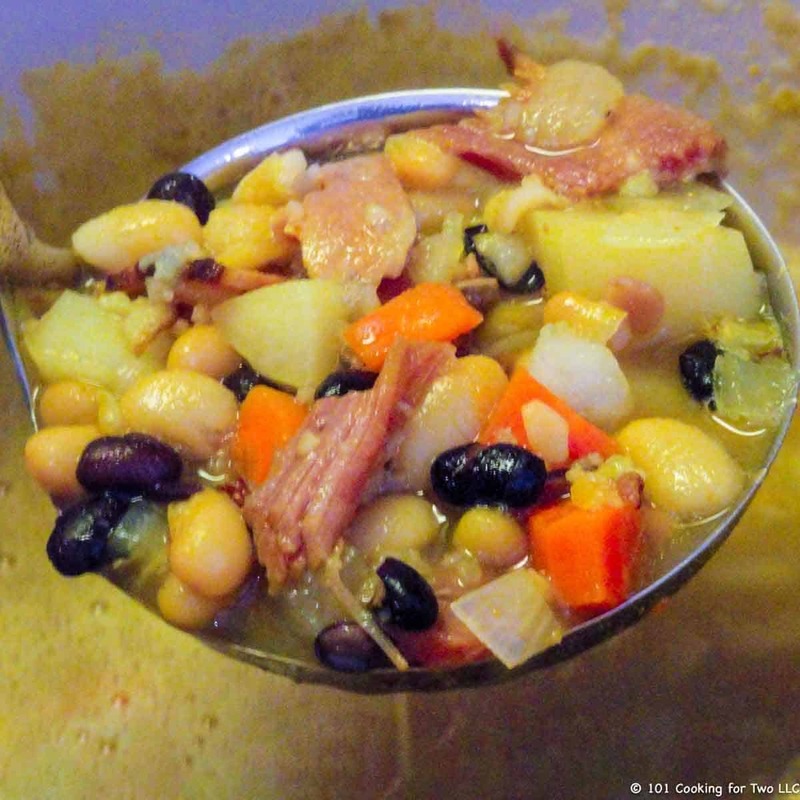 Shake up your ham and bean soup with this Puerto Rican ham bone soup. You will love this excellent soup. 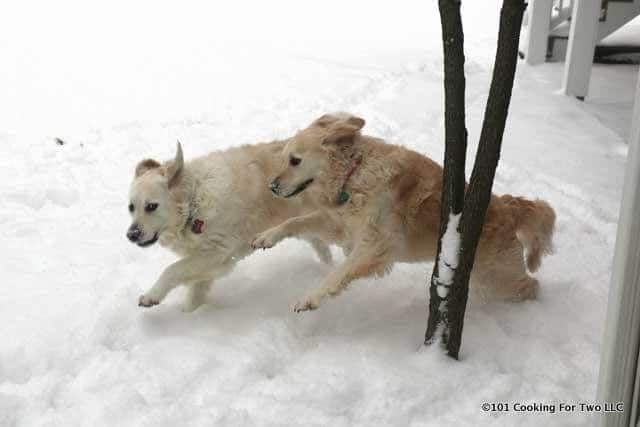 Editor’s Note: Originally Published February 3, 2011. Last Updated July 13, 2018, with newly edited pictures and text. This has been a standard at our house for years. We are the only ones calling it Christmas soup, but I’m sticking with the name since that is when we usually make it. We all love our a good ham and white bean soup, and my ham bone vegetable soup is also a great hearty meal. But this soup brings some definite change of pace with the seasoning that makes my wife as for this one most commonly (like this last Sunday). I originally called this recipe “Puerto Rican Chuletón Soup AKA Xmas Ham Bone Soup” but shortened the name. Based on a recipe from a children book Everybody Serves Soup by Norah Dooley. I should have guessed the origin with two children librarians in the family (wife and a daughter). It is very good with thick and hammy taste. 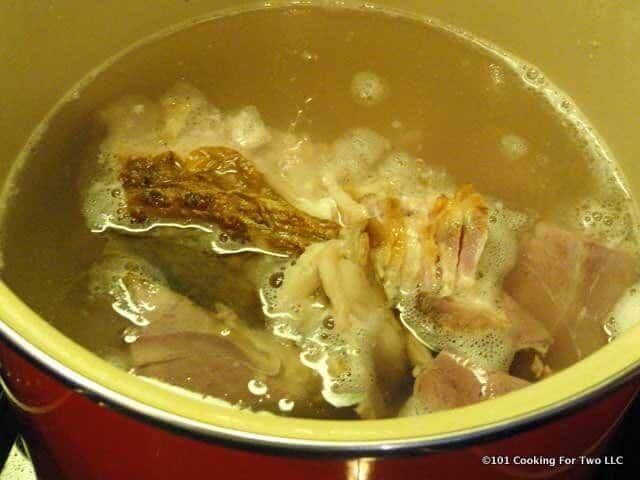 Like all my ham soups anymore, I just use water with the ham bone to make the broth. I don’t see the need to use chicken broth which will add salt. There is plenty of that is the ham already. If your ham is covered with a sugary coat of some type, rinse off as much as possible under running water before starting. The original recipe calls for pigeon beans… not in West Michigan. I see this as your option to make the soup what you want. I used black and navy beans. 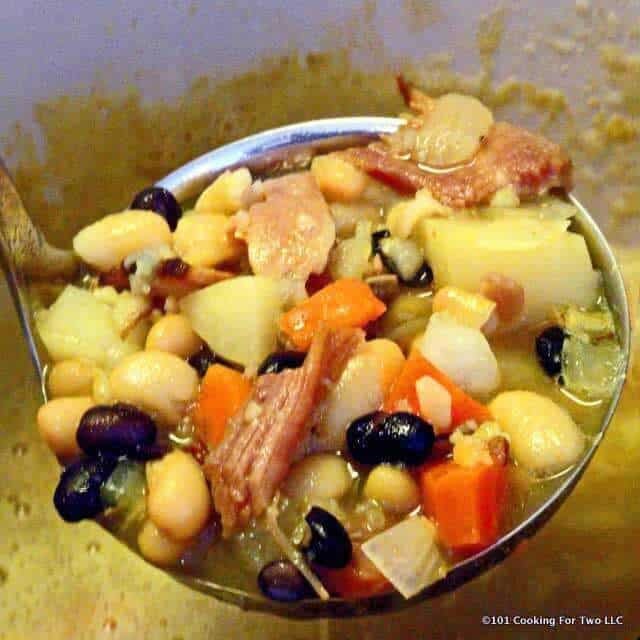 This is a stovetop recipe but can be done easily in a crock pot. Add everything at the beginning. Cook on low for 2-3 hours, then remove the ham bone and strip the meat. Add the meat back and cook for another 1-2 hours until potatoes and carrots are tender. I would prefer to cool in the refrigerator overnight then skim the fat before serving but not required. We had a very large ham bone with lots of meat on it for the pictures. It took 12 cups of water to cover the bone reasonable, so I increased all other ingredients proportionally. I ended up with an enormous amount of soup. Half is in the freeze. This is so NOT cooking for two friendly unless you have freezer space or a crowd coming for dinner. Rinse the ham bone under running water if there is a sugary coating. Also if there are large chunks of fat, then trim them some. Cover the ham most of the way with water. Measure water and increase all other ingredients proportionally. Bring to boil over medium-high heat and then decrease to low and simmer for 60 to 90 minutes. 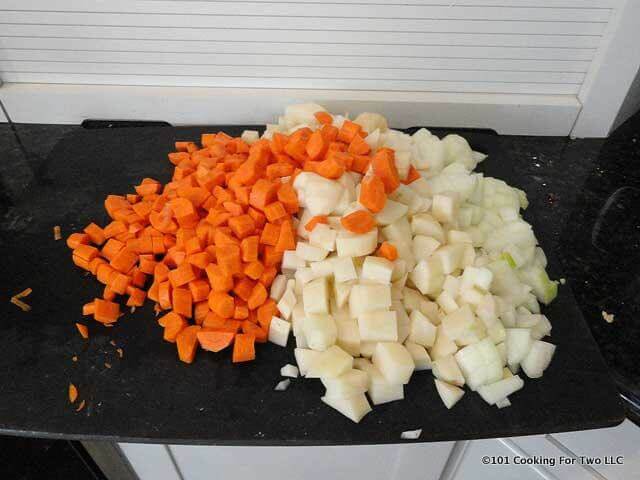 Peel and chop potatoes and carrots into bite-size pieces. Chop onions. 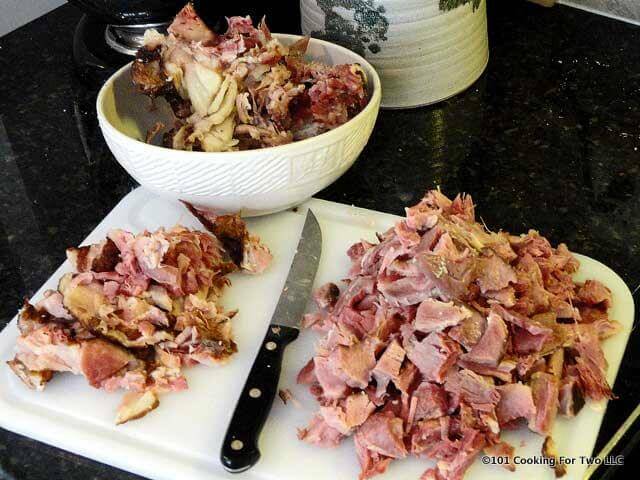 After ham is cooled a bit, hand clean and shred into bite-size pieces. Add all ingredients back to broth. 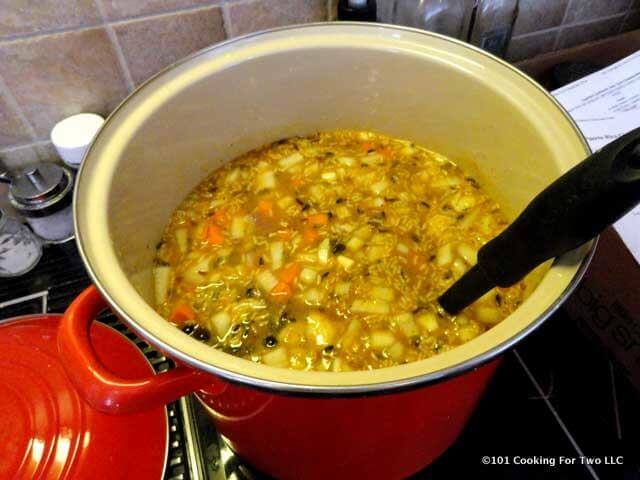 Bring to boil with medium-high heat then decrease to simmer for 1-2 hours until potatoes and carrots are done. Cool in the refrigerator overnight then skim the fat before serving is recommended but not required. Originally Published February 3, 2011. Not sure what makes this Puerto Rican. Where is the sofrito, the Adobo, the Sazon, or even some cilantro. The pigeon peas, gondolas, would have been the only thing typically Puerto Rican. :( I am sad. I thought I had found a new recipe.